The Spring Symposium is the Geophysical Society of Houston’s premier technical event of the year. 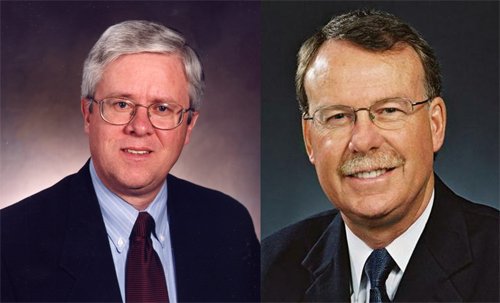 The 2019 symposium is scheduled for April 16-17 and will honor the accomplishments of Dan Hampson and Brian Russell. Dan and Brian are well known for the development of industry leading geophysical analysis software. Many in the industry developed their quantitative interpretation and reservoir characterization skills using their software. Dan and Brian received the Cecil Green Enterprise Award from the SEG in recognition of their contributions to our industry. The theme of the 2019 symposium is “the Resurgence of Seismic Inversion”. It will include theory and case studies highlighting advances in seismic inversion that impact drilling decisions. The symposium talks will feature industry experts from operators, service companies and academia. Unique to this meeting are the extended presentation and discussion time. Ample time is allowed to fully develop topics and engage in lively discussion. As in previous years the program will include a SEG Student Challenge Bowl, a roast of our two honorees and a vendor hour. The vendor hour provides time to relax with a beverage and leisurely review the capabilities of leading industry vendors. DAN HAMPSON received a BSc degree in physics from Loyola College, Montreal in 1971, a MSc in theoretical physics from McMaster University, Hamilton in 1973, and an MBA from University of Calgary in 1993. In 1976, Dan joined Veritas Seismic Processors, where he held a number of positions, including research manager and ultimately VP for Research. In 1987, Dan joined with Brian Russell to form Hampson-Russell Software Services, where he was president from 1987 to 2002. In 2002, Hampson-Russell was acquired by VeritasDGC, which was acquired by CGG in 2006. Dan is currently a Vice President within the CGG GeoSoftware division. Dan has been actively involved in the CSEG and SEG. From 1979 to 1999, Dan served as Journal Editor, Second VP, Chair of the Annual Convention, and President of the CSEG. In 1996, Dan Hampson and Brian Russell received the SEG’s Enterprise Award for the contribution of their company to the industry. In 2004, Dan received the CSEG Medal. Dan continues to pursue his interests in seismic inversion and reservoir characterization. He is currently investigating the use of Deep Neural Networks to enhance and extend the inversion process. BRIAN RUSSELL holds a B.Sc. from the University of Saskatchewan (1975), a M.Sc. from Durham University (1978), U.K., and a Ph.D. from the University of Calgary (2004), all in geophysics. He joined Chevron in Calgary as an exploration geophysicist in 1975 and subsequently worked for Teknica and Veritas before co-founding Hampson-Russell Software with Dan Hampson in 1987. Hampson-Russell is now a subsidiary of CGG, where Brian is Vice President, GeoSoftware and a CGG Fellow. Brian is involved in the research of new AVO, rock physics, inversion and seismic attribute techniques as well as giving courses and talks throughout the world. He is a Past-President of both SEG and CSEG and has received Honorary Membership from both societies, as well as the Cecil Green Enterprise Award from SEG (jointly with Dan Hampson). Brian is an Adjunct Professor in the Department of Geoscience at the University of Calgary and is registered as a Professional Geophysicist (P.Geoph.) in Alberta. He is also currently on the Boards of the M.Sc. in Integrated Petroleum Geosciences (IPG) at the University of Alberta and the Pacific Institute for the Mathematical Sciences (PIMS) at the University of British Columbia. Would you like to leave a special message for our Honorees in the Event Booklet? Reminder: You Must Be Logged in to Register and view all pricing options.